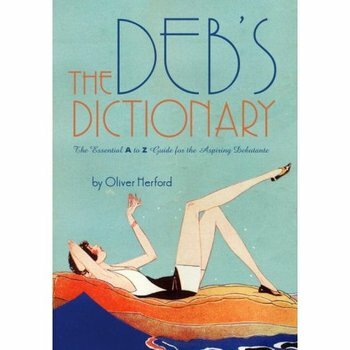 I came across The Deb's Dictionary, first published in 1931, reissued (with "minor modifications") in 2007. Abash - To shock people, formerly done without difficulty, today almost an impossibility. Adamant - A mineral substance not so hard as a woman's will and softer than a woman's won't. Alas! - Early Victorian for Oh, hell! Art - a nature hater's appreciation of nature. Hmmm, makes me want to find an original issue and see what the mods were. "Her hair was kempt, her clothing shevelled..."
Every once in a while, I'm going to post (or link to) essays or dialogue that use words in an amusing and clever way. I categorize it as "word play." One example is Abbott and Costello's famous "Who's on First" skit. But for today, I'll send you off to read "How I Met My Wife," by Jack Winters, first published in the New Yorker (July 19, 1994). "I was furling my wieldy umbrella for the coat check when I saw her standing alone in a corner. She was a descript person, a woman in a state of total array. Her hair was kempt, her clothing shevelled, and she moved in a gainly way." It's a sweet little story of requited love. By all means, let me know about your favorite word play writing.